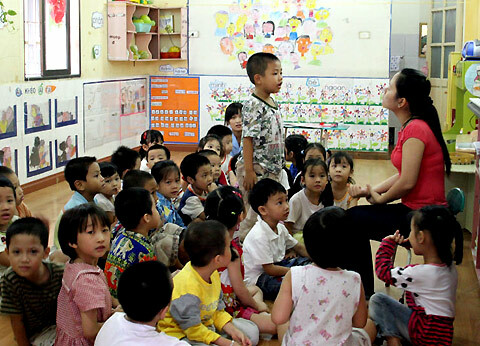 HA NOI (VNS)— Prime Minister Nguyen Tan Dung has approved a project to train 80 per cent of private daycares' teachers and babysitters in industrial and export processing zones nationwide by 2020. Seventy per cent of the children under the age of three, who are located in the areas where the project will be implemented, will also be kept at centres adhering to high-quality standards, he stated. Mothers of the children will be offered training in childcare to enhance the role of families in child development. The Viet Nam Women's Union will work in tandem with the Ministry of Education and Training to provide training courses. Expenses will be covered by the State, local companies, organisations, and individual donations. Communication campaigns will also be launched to increase the involvement of local authorities and enterprises in supporting the project. The government's financial assistance will help to build new centres, while upgrading the current ones, the prime minister remarked. A total of 500 private centres will receive support through this initiative. The project also encourages the professional exchange between private childcare centres in the industrial and export processing zones and local nursery schools.